Th-INK-ing of You: A Sweet Easter Lamb! With Easter coming early this year, it's time to get those Easter cards made and ready! 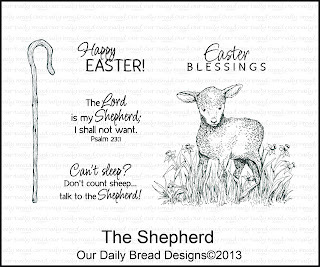 This month's release at Our Daily Bread designs has some perfect sets for Easter and honestly I love them all! If you know me, you KNOW I love all the flower stamps, but I also love this absolutely sweet lamb set! It's called The Shepherd and I think the artwork is just awesome! I created this card using Spellbinders Labels 8 and Decorative Labels 8. I also used a SB Back to Basics Tag. My scene is colored with Copics and then I popped up the Our Daily Bread designs Fence Die cut on 1/8" dimensionals to give just a little depth. The greenery is punched with a Punch Bunch punch. The flower is a Prima. Adorable! I love the layers of white, it reminds me of the antique Holy Cards. Good design how you added green in front as well as in back of fence. Beautiful, Grace! So sweet Grace!! I just love your little lamb and your layout! !the fence and the added foliage is perfect for your scene. Stunning and darling Easter card!! You always make the most beautiful cards! I really look forward to your posts, Grace! I love the way you have the fence tucked in under the die cut. All the white with the lanb which to me symbolized the Lamb of God, the white, (" tho your sins be as scarlet") as snow and your green made me think of Psalm 23. Grace Your Cards each and everyone is just Amazing. I love everyone . each one is even prettier then the last. 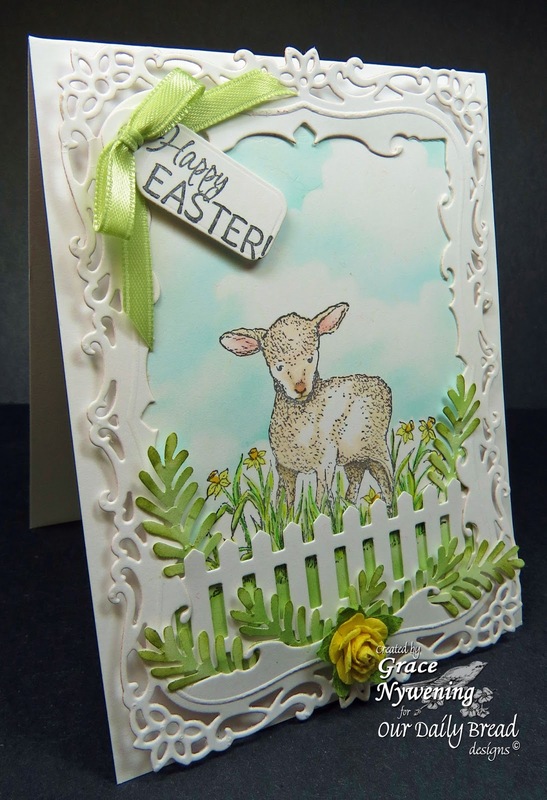 such a very sweet card, love the little sheep with the fence, and your addition of greenery, and the framing is just terrific! Grace, this is just gorgeous. Love the frame and love how you did the clouds. And that picket fence is just so perfect with this adorable image, which I just ordered today :). This is just so soft, sweet and lovely. I love this stamp set, and you've done a beautiful job with it. Thanks so much for sharing with us again this week. What a blessing to have your gorgeous creations shared with us and to have you fellowship with us. Have a blessed week! Gorgeous card, wow ,love the frame and the fence!The image is just wonderful. Thanks for sharing this with us at LEJ Designs! Hi Grace. This is so adorable. Lovely embellishments and colouring. Thank you so much for joining in this weeks Addicted to Stamps and More challenge. Grace, this is awesome. I can't believe it is something made by hand. This is truly gorgeous. Your card is an adorable Easter card...perfect! May God Bless you today. Thanks so much for joining us a Penny's Paper-Crafty Challenges this week!